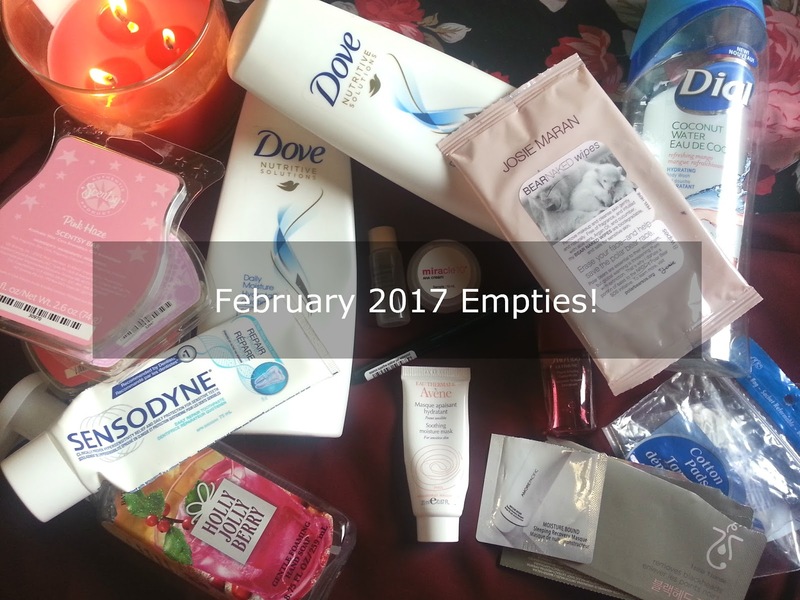 Deidre's Discoveries: February 2017 - Empties! And we're back again with another end of the month! It's really crazy how time is going by so quickly. It just felt like Christmas and New Years, and here we are, the beginning of March! I'm looking forward to more daylight, spring flowers, and no more snow! Well, fingers crossed on the last one! Being in Ontario, we could get some snow up until April, but let's not jinx it! Anyway, let's take a look at my empties for February. I didn't manage to finish as much as I hoped to, but every little bit helps! There are some items missing from the photo above, but I will get into detail about those below! 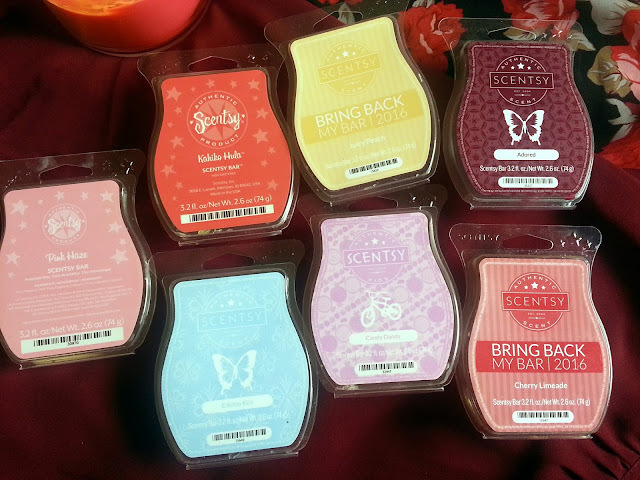 I think I've mentioned in previous posts, that I'm trying to use up a bunch of my Scentsy wax bars. I just have so many, and they are put into a drawer, so I tend not to go through them as fast as others. I decided to repurpose my tin gift packaging from The Body Shop (I'll show you in a Five on Friday post) and placed some bars in there. This way, the tin is always out, and I will see them. It will encourage me to use up some scents that I'm not the biggest fan of, or use the ones that are getting older. I managed to finish 7 bars in February! Now, they aren't always full when I pull them out to finish them. Some only have a few cubes left, which makes them even easier to finish. *Pink Haze - A sweet confection of berries, nectarines, and vanilla-laced whipped cream nestled in marshmallow fondant. - This was a huge hit! It's sweet, but not overly sweet. I wouldn't say that any one of those notes stick out a ton to me, but overall it's a great scent, and I repurchased another before it was discontinued. Kahiko Hula - Say "Aloha" with exotic passionfruit, mango, and papaya. - This is a part of the regular line up, so it's always available. Very tropical, and I would repurchase in the future. *Eskimo Kiss - Blackberry jam, caramelized brown sugar, vanilla and amber in a softly romantic scent. - Romantic is a good word for this. The amber was probably the strongest note I recognized in this, but the vanilla and sugar toned it down. This is a part of the Fall and Winter scents so it's not available now, but I would probably repurchase it in the future. *Juicy Peach - Mouthwatering, freshly picked, sweet juicy peach. - This definitely was a juicy peach scent. While it was nice and fruity, I don't think I would repurchase this one. *Candy Dandy - Kids will go crazy for this delicious, candy-scented concoction of mango, lemon drops and creamy vanilla. - This one reminds me of pink starburst. It smelled so good, but the throw wasn't strong enough for me. *Adored - Fun, flirtatious cherry, black plum, and a warm whiff of sandalwood spin a succulent springtime yarn. - This is definitely a deeper berry kind of scent. I really enjoyed it for Fall. I don't think I would repurchase it again, just because I have other favourite Fall scents that are a little similar. *Cherry Limeade - Zesty key lime, sweet cherry, and juicy berry: a delicious scent reminiscent of a soda fountain drink. - I was disappointed in this one. I was hoping it would be a stronger cherry/berry scent... somewhat like a cherry kool-aid, with a hint of lime. But the lime was very strong in this one, and overall I was just not a fan of it. I would not repurchase this if it became available again in the future. 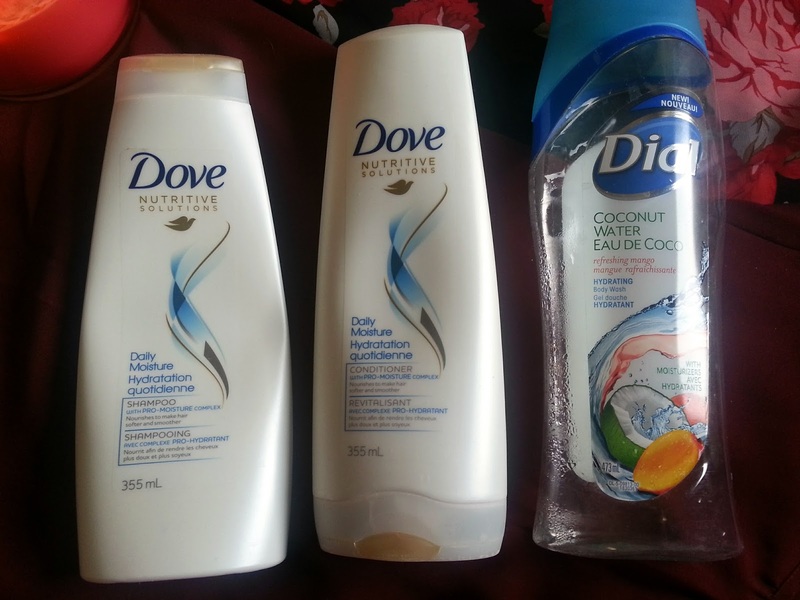 I used to enjoy Dove shampoos and conditioners because they used to make my hair feel so soft and smooth, but as time has gone on, I've found other brands that do the same thing. Dove is pretty inexpensive to purchase, but I find that sometimes they make my hair greasy after a day, and my scalp just doesn't like it. These make it itchy and dry, every time I use them. I wouldn't repurchase these in the future. Loved the scent of this. Love how it lathered. I enjoy Dial body wash. I would repurchase in the future when they are on sale... I need to get through a ton of other shower gels though before I do that! These wipes were just okay. They left a little bit of an oily residue on my skin. I don't really use wipes as the only step to remove makeup. I tend to prefer to oil cleanse and then use a creamy or foamy cleanser afterwards. These were good to remove swatches, but didn't do the greatest job at removing mascara. I wouldn't repurchase these. These were kind of cool in the fact that it was 3 steps. You first wear a strip that is supposed to soften the sebum in your nose pores. Then you apply the actual nose strip and wear it for about 15 minutes, then when you remove it, there is an essence they provide. Overall, I didn't notice many blackheads come out, and it did sting a little. I don't think I would repurchase these in the future, just because it felt like a few too many steps, and I just don't use nose strips too often. These are just round cotton pads from the dollar store. They aren't the greatest quality, but they get the job done. I would repurchase them in the future just because they are so cheap, and they do what they need to do. Although Walmart's equate brand is just a little better quality. I know this is just a foil, but I got quite a few uses out of it, and I really loved it. It's gentle, and didn't make my skin feel stripped at all. I have another foil, and a sample tube, and I think I may repurchase a full size in the future when Sephora has their sale. This really did add moisture to my skin. There was only enough to use it once, but my skin really loved it. The price tag is scary though, so I probably wouldn't repurchase it. But who knows, I may change my mind. I purchased two of these during the Black Friday sale that Essence was having. I had never tried their products before and wanted to give them a chance. This eyeliner pen missed the mark for me. It dried out super quickly, and it was never as pigmented as I would like. I also found that it dragged quite a bit, so some areas looked bare and others had eyeliner. I'd skip eyeliner pens in the future and stick to the brush tips that I prefer. Jesse's Girl liquid eyeliner has been my all time favourite for a few years. I've heard it's a dupe for KVD tattoo liner. 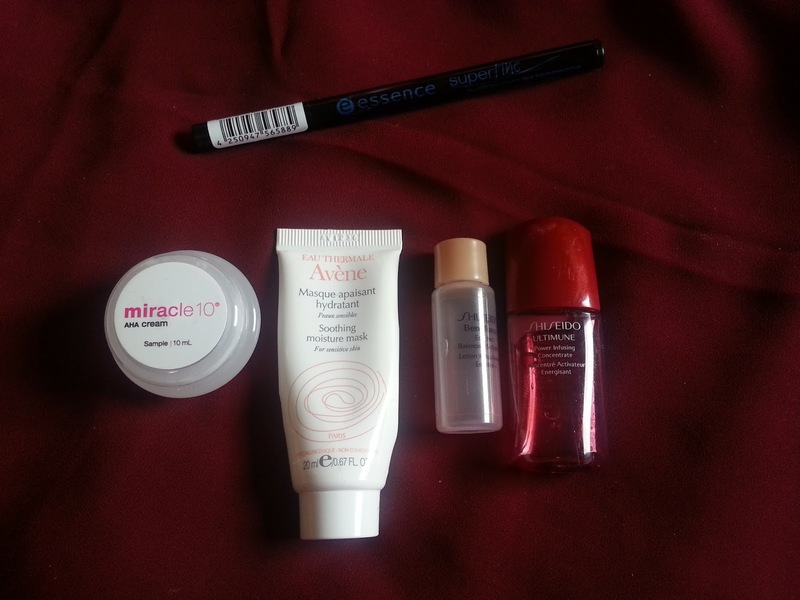 I received this as a sample from a Topbox promotion I believe, and I did like it. I still found my skin looked a little dehydrated when I put foundation on, but this AHA cream made my skin feel so smooth. It's $64.00 for 50mL, which is a little pricey. I'm using Neostrata Glycolic Renewing Smoothing Cream (10% Glycolic Acid) now and it's more affordable. We'll see what I end up enjoying more when I'm done with it. 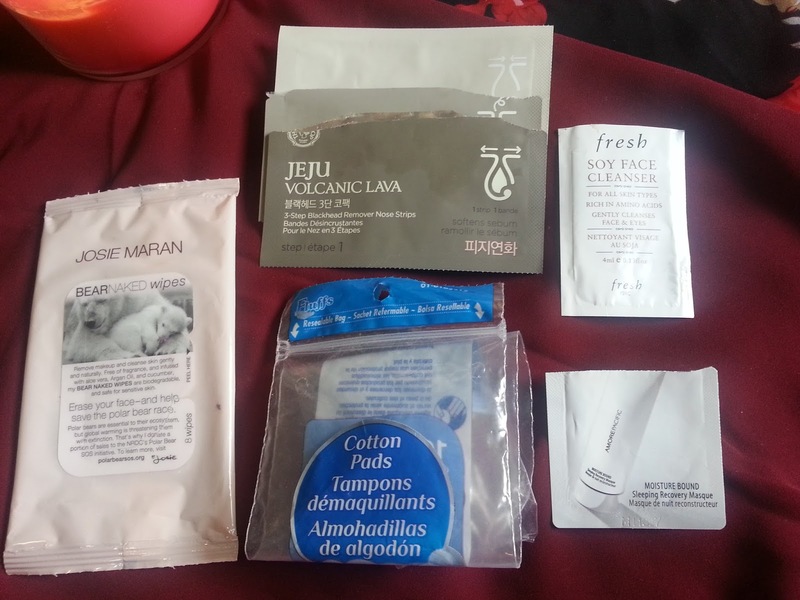 I really enjoyed this moisture mask! It was a cream texture, and I would apply it at night mixed with some of my Tarte Maracuja Oil. My skin would look hydrated in the morning. I just wish this sample size was bigger! I'd consider repurchasing this in the future! This is older than I would like to admit... but I really love this stuff. I used it as a toner and it made my skin feel hydrated, and smooth. I used to have a full size bottle of this a few years back and it made my skin feel great. It's a little thicker than your typical toner, but it provides so much hydration. I'm considering repurchasing this in the future. It does have a scent that some people probably would not like, but it didn't bother my skin at all. I was using this like a serum, and I don't think it really made a difference in the way my skin looked, but it had somewhat of a cooling feeling, and felt great. I wouldn't repurchase this just because it's pricey and I didn't notice a big enough change in my skin. This was not as berry scented as I thought it would be, but it was nice and fruity. I really like the foaming hand soaps. 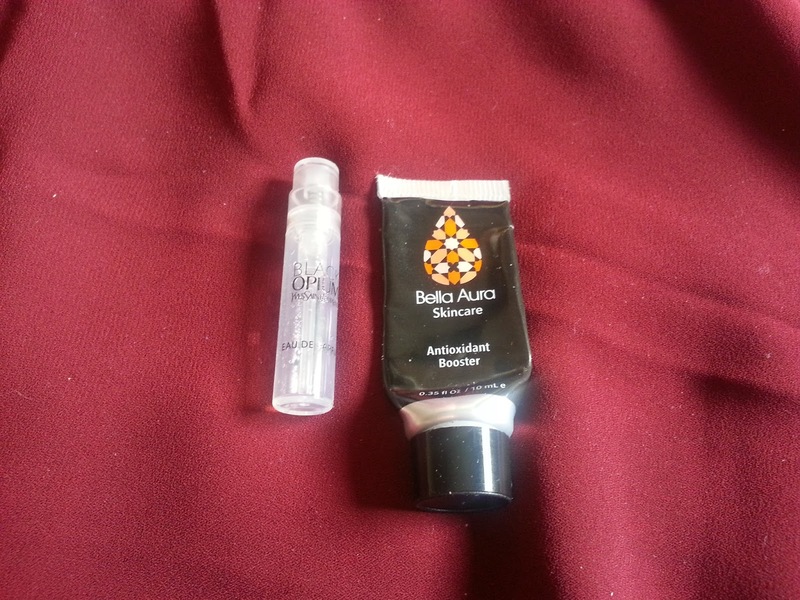 I've already repurchased other scents, so these will be in quite a few more empties. This toothpaste has novamin in it, which is supposed to help prevent cavities and "repair" those that might be starting. 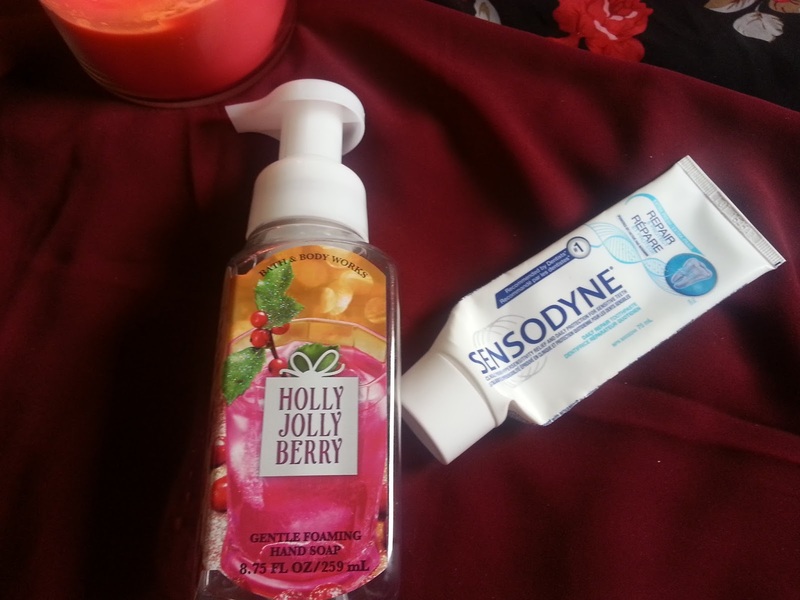 I do have sensitive teeth, and I found when I first started to use this, my teeth were even more sensitive, but as I've continued to use this, that sensitivity has gone down. I wish the mint flavour was a little longer lasting, but I've already repurchased. I love this scent! I purchased the full size at the end of 2016. You know when you have a skincare item, and you try it over and over, in hopes that you will see or feel some sort of results, but you never do? That was this product for me. I kept using it until there was nothing left in the tube, and honestly, I had no results. It didn't make my skin look or feel more hydrated, and I really disliked the scent. I would not repurchase this in the future, because they are pricey, and I didn't see any results. Again, I don't go into too much details for these masks. 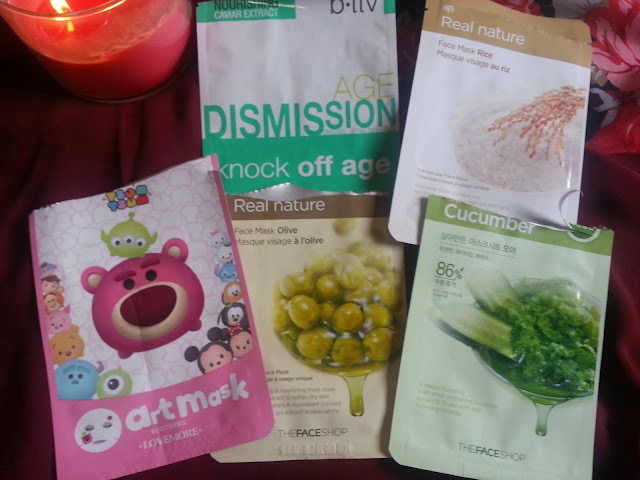 The three Real Nature masks are all repeats, and I really enjoyed all three... especially the rice mask. The B-Liv was gifted to me in a product swap, and while I do like how it felt, I didn't notice any remarkable changes in my skin - but that was expected as it's a one time use sheet mask, and I don't have others to continue with. And finally, the LoveMore Disney Tsum Tsum soothing mask. This fit well, but I was a little sad that the graphics weren't fully covering the mask itself. There was one cartoon on the cheek and that was about it. But it did feel nice on the skin. I wish I had used up more than 5 though! So for the month of February, I only finished 29 items. A little lower than December and January, but I had a feeling it would be! I was doing so good for those few months. I'm hoping I will have a bit more for March!